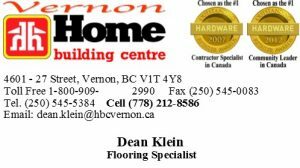 Home Building Centre carries a large assortment of flooring products as carpet, ceramic tiles, cork floors, stone tiles, laminate, hardwood floors and more. 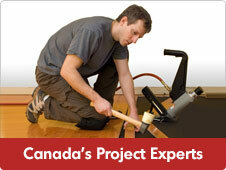 Our qualified and experienced staff can assist you with any flooring product needs. 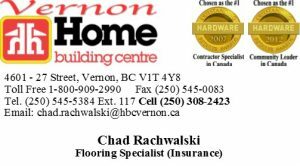 Do you need to new or replacement flooring in your home or office? Come into our Vernon store today to see our large assortment of samples and receive personal service from our staff. 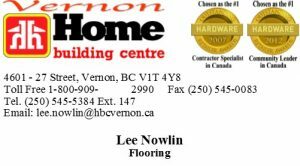 Home Building Centre has been in flooring and installs for over 20 years. Our staff have a collective experience of over 15 yrs. Residential or commercial flooring is what we do well. Do you need to have someone visit your home or office to measure the flooring area you need to cover? 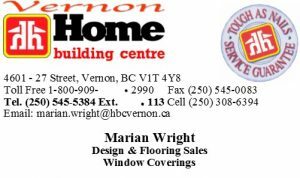 Come in and visit or call your personal contact (see below) and arrange a visit to your home of office for custom measuring. Ames Tile & Stone began in 1912 as Ames Bros. Distributors Ltd. on Alexander Street in downtown Vancouver. Founded by Cyril Ames and his brother David, Ames Bros. started as a small agency business. The Antique Impressions brand of exclusive hardwood flooring is a distinctive expression of individuality. Unique in the industry for our focus on small batch, handcrafted flooring, we are obsessed with bringing forth original niche products with value that is unequaled in today's marketplace. The entire line of Antique Impressions flooring, designed and manufactured by Creative At Home, is made with strict adherence to our core principles of quality, originality, and service. Armstrong offers hundreds of flooring options for you to choose from. Our hardwood floors are available in many popular wood species, from classic oak to exotic tropical hardwoods. Importer & distributor of floor & wall products, ceramics, laminate, carpet & resilient flooring. Centura sources and imports the highest quality products from major international manufacturers located in Italy, Spain, Turkey, Asia, South America and the USA. The company proudly aligns themselves with major Canadian manufacturers, such as Amtico, Tarkett, Schluter, Venture Carpets, Bell Carpets and Vallefoam, many of which bear the made-in-Canada seal. Ceratec is a family business built on solid values; Passion, Integrity, Humility, Collaboration, Transparency. Ceratec, importer and distributor of tiles made of ceramic, porcelain, natural stone, and slate as well as glass mosaics for walls, floors, and counters in kitchens, living rooms, and bathrooms. Dalla Terra means "of the earth", a fitting representation of our product line. What makes us tick? Quite simply, our dedication to quality, customer satisfaction, and the good feeling that comes from making the world a little more beautiful. We are committed to doing things in a way that can only be defined as the best in its class. As the country’s leading manufacturer and distributor of ceramic tile and natural stone, our vast resources allow us to be a true single source supplier for the flooring industry and our amazing palette of products makes us a convenient and knowledgeable choice for any design. Daltile is committed to staying on top of the latest and most progressive Tile & Stone innovations. New technologies are constantly being discovered; these are just a few of the innovations we currently offer. The EUROSTYLE Flooring Company in Greater Vancouver, supplies premium European floors across Canada, that are 100% manufactured in Germany by one of the worldwide leading producers of high quality laminate & vinyl floorings. Kronoflooring GmbH, Lampertswalde is represented in specialist flooring trade as well as in specialist store segments with a wide range of wood-based material products for floors, walls and ceilings. Through many years of experience, extensive technical know-how and high product quality, EUROSTYLE is proud to be made by an innovative company. Our technologies are constantly developed further, bringing new flooring products to the market, and distributed by ETM Distribution Inc.
We currently service all of Western Canada through our extensive dealer network and through our showroom and distribution centres in Burnaby B.C., Calgary and Edmonton, Alberta. Euro's commitment to excellence is evidenced through our association with only the most reputable tile manufacturers in the world, producing products that meet our high standards and the standards of our discerning clientele. Hallmark Floors firmly believes in the total satisfaction of the consumer and are proud of the products we manufacture. To that end, we believe there is NO substitute for the personal, professional service that a local store offering installation advice and service, plus the local knowledge of the proper selection of Hardwood Flooring and Luxury Vinyl Flooring offers. Our mission is to be passionate at every step of the manufacturing process. We endeavor to Demonstrate responsibility and stewardship for the natural resources divinely entrusted to us. Conduct our business in a way that reflects a deep commitment to our Creator by living a life of service to others. Diligently pursue this commitment of service with compassion and respect for our customers. North America's fastest growing flooring trend - Vinyl flooring is suitable for both commercial and residential use. Made from extremely durable pure vinyl, Harbinger Flooring is virtually indistinguishable from the natural beauty of the materials which inspire our designs with none of the practical drawbacks. Harbinger Flooring offers significant advantages in terms of increased performance and lower maintenance. Whichever style or pattern you choose - Harbinger Flooring brings great looking, classic style to any commercial or residential application. Established in 1978 Julian Ceramic Tile Inc. has grown to be one of the top Tile Wholesale-Distributors in Western Canada and Western USA. We have been there, we have inspected the factories and the quarries and we know that every item in the Julian Collection is of the finest quality. That is a guarantee of excellence you can count on. The ethics and values of our founder run through all teams and aspects within our business and we're proud to be a leader in environmental commitment with a focus on corporate social responsibility. Use the menu to the left to learn more about Karndean Designflooring. One of the world’s leading manufacturers of fine flooring. Mannington is a fourth generation family-owned business with values. After almost 100 years, Mannington continues to pursue its commitment to quality, customer satisfaction and the environment care through innovative product design. The spirit of innovation and concern for the environment that has been driving us for more than 35 years is today constantly pushing us to innovate and seek even more eco-smart methods. Our philosophy is simple: to highlight the beauty and richness of wood while fully respecting our forests, by using healthy and ecological processes that ensure the health of those who walk on our hardwood floors. Mercier Wood Flooring has developed not only the best hardwood floors on the market, but also the healthiest and most sustainable. Choose your Mercier hardwood floor from among more than 2,000 possibilities to add style and character to your home. Ever since we rolled out the first Mohawk carpets in 1878, we've built quality into every flooring product we make. We continue that tradition today with revolutionary product innovation, award-winning design, and a talented team dedicated to outstanding service. We merge commendable thought with affordable customer budgets to produce hardwoods that surpass customer expectations. Our team has 100 years combined in the flooring industry and with our expertise you can be sure you’re receiving the best. Olympia has the most comprehensive range of products and the largest supply-ready inventories with style-setting lines made to the highest standards of quality and performance. In recent years, Olympa was awarded the “North American Distributor Award - 2003" from the prestigious Italian tile Manufacturers’ association, Assopiastrelle. The Greater Toronto Home Builders’ Association have thrice (2006, 2009 and 2013) awarded Olympia their “Best Distributor Award” recognizing Olympia, from amongst all of their construction product suppliers. Pravada Floors is a leading manufacturer and trusted provider of quality wood flooring products in North America. Pravada Floors'products are available throughout various retail distribution centers worldwide. We are committed to redefining the look of floors and beautify interior spaces, offering product value, sustainable flooring solutions and incredible style options. All of Pravada's flooring products are backed by a 35 or 25 year limited warranty. Pravada Floors is dedicated to practicing sustainable forest management, helping preserve today's forests for the future. Our floors are made using less raw harvested wood materials than other floors. Like you, Shaw Floors is passionate about creating beautiful homes founded on innovative design and lasting function. We know that a beautiful room doesn’t happen by accident. It’s a process. It’s deliberate. And it all starts with the floor. Flooring can change the look, feel and function of a room, bringing together a beautiful, yet subtle masterpiece, artfully crafted by you. From the soft pale carpet for a sleeping sanctuary to the powerful Grand Canyon hardwood for a culinary haven, floors support your family’s every move. A recognized leader in environmental stewardship, Shaw has implemented hundreds of sustainability initiatives and cradle-to-cradle design solutions, collectively termed the Shaw Green Edge. Shnier is Canada's leading national floor covering solutions company. Founded by George Edward Shnier in 1938, the company has grown to become a dominant force in Canadian floor covering industry. Providing fashionable and contemporary products, comprehensive integrated marketing programs, and industry leading logistical services, Shnier has earned the reputation of being one of the most innovative, leading edge organizations in the Canadian floor covering industry, operating on a foundation of solid business ethics and values. Tierra Sol has been offering a vast collection of beautiful tiles to designers, architects, contractors, and retailers for over 30 years. A family owned Canadian business, Tierra Sol is ready to make your tile dreams a reality at any of its 4 locations in Calgary, Edmonton, Vancouver, and Seattle. Tierra Sol's mission is to source exquisite and awe-inspiring tile from around the globe, offering a selection that will never leave you wanting for more. Our collection of sustainable and timeless porcelain tile, glass mosaics, and natural stones sourced the world over have inspired countless designers and builders. Torlys is a flooring company specializing in beautiful, easy to maintain, smart and green flooring. TORLYS Cork, Hardwood, Laminate and Leather floors are available through a worldwide network of specialized dealers. At TORLYS, we make beautiful, long lasting floors, but not at the expense of the environment. TORLYS is headquartered in a 86,000 sq. ft. facility in Mississauga, Ontario and has a 31,000 sq. ft. facility in Calgary, Alberta. We provide professional installations of your floors, guaranteed. No surprises, No hidden costs, complete satisfaction. We provide only reliable, insured professional installers who ensure quality workmanship. Our installers adhere to, or exceed, all local building codes and regulations. They’ll complete the job with minimal inconvenience to your family, and when your project is complete, they’ll perform a thorough clean-up. Read more about our professional installations, or call us or drop in and we would be happy to show you.